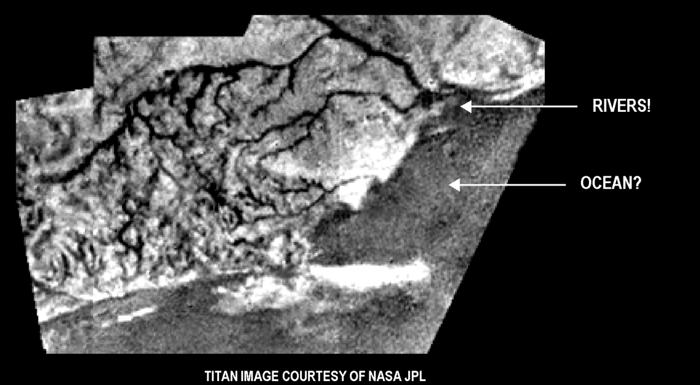 Answer: The big deal is that, up until now, we had no real images of the surface of Titan, Saturn’s largest moon. It is perpetually shrouded in a thick cloud of nitrogen and methane. From space, the surface can’t be seen. To image it, we needed to get a camera below the cloud level. On January 14th, the European Space Agency probe Huygens did just that. What it found was truly amazing! Turns out Titan has a weather cycle similar to ours. On Earth we have evaporation, precipitation, and transport of H2O, the well known hydrologic cycle. On Titan, it’s a “methalogic” cycle. The -300° F temperature allows methane (CH4) to do what water does here on Earth. There are methane oceans and rivers, and methane clouds that drop methane rain and snow. The image above shows what the Huygens probe saw during its decent to the surface. The river channels are easy to see. We’re not yet sure if the ocean is permanent or transient, but its shoreline is clearly visible. There is indeed “weather” here. Besides Earth, no other planet or moon was known to have such a weather cycle. It is this similarity that thrills scientists. Studying Titan will teach us more about our own planet’s weather.